What if the huge and unnecessary interchange where Colfax Avenue and Federal Boulevard converge was replaced by streets scaled for people? What if, instead of cars and smog, the 29-acre “cloverleaf” contained homes and parks? You can get a feel for the possibilities on Sunday from 11 a.m. to 4 p.m., when the entire southwest section of the interchange will be car-free to make way for a marketplace, parks, food trucks, live music, a learning center, and a 150-foot mural envisioning housing on the site. A parking-protected bike lane lined with lowriders will take over the on-ramp. The gargantuan highway interchange is a threat to life and limb for people on foot, and west siders are over it. 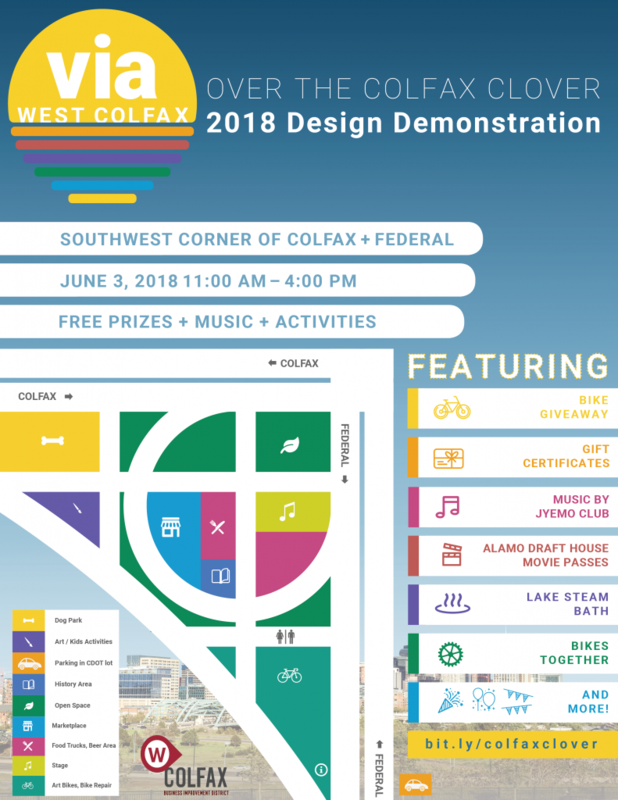 Hence the name of the event: Over the Colfax Clover Design Demonstration. Drivers injured 25 people walking and biking around the cloverleaf between 2012 and 2017, according to the project team, which includes the West Colfax Business Improvement District, WalkDenver, and planning firms Michael Baker International and Critter Thompson Consulting. All this hulking car infrastructure is overbuilt and unwarranted. Fewer vehicles pass through the interchange on an average weekday — 18,715 — than the at-grade intersection of Colfax Avenue and Colorado Boulevard — 27,018 — according to traffic counts from Denver Public Works. Sunday’s demonstration grew out of feedback collected at public events and from interviews with local residents. Advocates see it as a way to build momentum for the permanent demolition of the highway interchange, helping residents and key government players like the Colorado Department of Transportation and DPW visualize what could take its place. “Having a fun event in the neighborhood — in the actual space — draws attention not only to the decision makers but also to the broader community so we can really boost how much influence we have and make a splash,”said Anne Kuchenmeister, a planner with Michael Baker International. The project team estimates the cost of restoring the street grid at $25 million. They’re looking to leverage private money, possibly from development opportunities that would open up, to get buy-in from CDOT and DPW. They’d also like to see the neighborhood vision included in official city plans, like the stadium district initiative. The project team will survey attendees during Sunday’s event, and record their ideas for how the area should change. The group is still looking for volunteers to help out. You can get to Over the Colfax Clover from the Decatur-Federal RTD station, or along the Colfax and Federal bus routes. There’s parking available at CDOT’s headquarters across from the station. This seems like a great, unique way to show how much space is wasted with cloverleafs, while also showing how people of the neighborhood would rather use the space dedicated to letting people speed past their neighborhood at highway speeds. Has this type of event happened anywhere else?